Reliance Jio has launched Jio Dhan Dhana Dhan offer for those who missed Jio summer surprise offer. April 15 was last Day for free Data now some users are able to use free data without Joining Jio Prime , disconnection has started for the users who haven't recharged their Jio number yet. "It's not going to happen all at once, so some users have already received the message about the disconnection, while for others it will take a little longer," the source explained, "but over the next couple of days it will happen for all users who have not recharged." 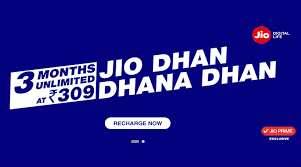 Any Reliance Jio user who has not recharged still has the option of getting the Dhan Dhana Dhan offer along with Jio Prime - so if your phone gets disconnected, you can simply go to a Jio store or head over to the Jio website or MyJio app, and pay Rs. 408 (Rs. 99 for Prime, and Rs. 309 for the offer) to get 84 days of data use.